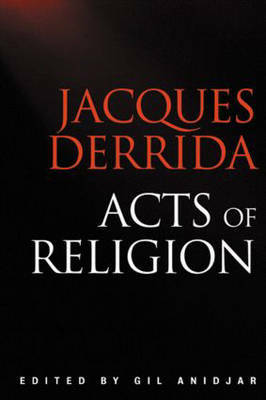 Acts of Religion, compiled in close association with Jacques Derrida, brings together for the first time a number of Derrida's writings on religion and questions of faith and their relation to philosophy and political culture. The essays discuss religious texts from Jewish, Christian, and Muslim traditions, as well as religious thinkers such as Kant, Levinas, and Gershom Scholem, and comprise pieces spanning Derrida's career. The collection includes two new essays by Derrida that appear here for the first time in any language, as well as a substantial introduction by Gil Anidjar that explores Derrida's return to his own "religious" origins and his attempts to bring to light hidden religious dimensions of the social, cultural, historical, and political.